IDIOMS ORGANISER is the most comprehensive idioms practice book for intermediate and advanced students. It is ideal for all students preparing for the FCE, CAE, Proficiency, IELTS and TOEFL exams. 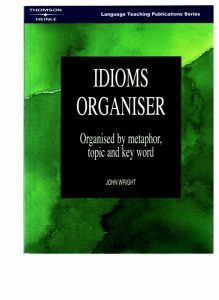 IDIOMS ORGANISER takes this difficult area for students and organises it in such a way that students at last can make sense of it.